Kelly 'The Ghost' Pavlik (38-2 33KO) is set to face Scott 'Cujo' Sigmon (22-3 12KO) at the Hard Rock Hotel and Casino, Las Vegas, Nevada on the 8th of June. The bout will be shown live on ESPN as part of their 'Friday Night Fights' series. Pavlik was very inactive in 2011 so he is looking to make up for that by fighting regularly in 2012 starting with a couple of tune-up fights. Pavlik's first fight of 2012 was a 2nd round stoppage win over Aaron Jaco. He will be looking for a similar win over Scott Sigmon who is considered a 'journeyman' by boxing fans. Sigmon's most notable fight is a loss to Jessie Nicklow, a man who Jermain Taylor stopped in eight rounds last December. And if you take into consideration the fact that Pavlik has beat Taylor twice, once by knock-out, this should be a walk in the park for him. Pavlik's last fight was at a catch-weight a couple of pounds above the Super Middleweight limit. This fight will most likely take place at Super Middleweight and should give us some indication as to how much power Pavlik has got at Super Middleweight. 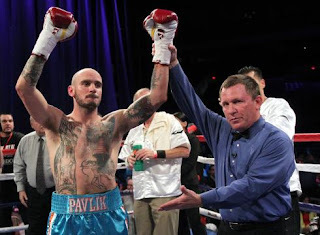 If Pavlik looks good against Sigmon then he is likely to fight a top ten ranked Super Middleweight. Who would you like to see 'The Ghost' fight next?